The Church Grants team works with some of the most amazing churches and Christian organisations in the UK, and we are dedicated to helping you find sources that you won't find anywhere else. Church Grants has been developed by Matthew Lagden, a fundraiser with many years' experience of raising funds for churches. 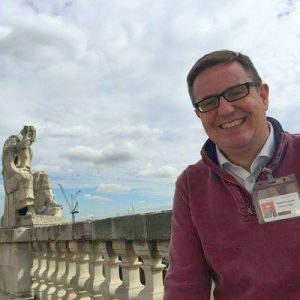 You may have come across his work through his church consultancy Mission-Focussed Fundraising Ltd, an organisation that specialises in raising funds for churches and other Christian projects. Before he set up Mission-Focussed Fundraising Ltd he worked as Director of Development at St Paul's Cathedral. Matthew has worked successfully with dozens of churches (and three cathedrals!) across England and Wales, ranging from historic rural churches to modern inner-city churches. He has raised funds for building projects, social justice work, and educational projects. In total he has raised well over Â£3 million through applications to trusts and foundations. Through his work Matthew realised that many of the churches that approached him for help didn't need assistance with fundraising (many churches are expert at fundraising! ), they simply needed help finding the right funds to apply to. He knew that the smaller local trusts and foundations would be incredibly hard and time consuming to find through the usual grant search engines. He began to keep lists of trusts and foundations that provide financial support to brilliant churches and organisations just like yours. These lists have now grown into what you see and can use today - the Church Grants database. The emphasis on this site is local funders, although we do have details for all the big national funders as well. In most cases the chances of success are much higher when a church applies to a local funder, the application processes are much easier, and in many cases (particularly with smaller projects), a small number of tightly focussed applications to local funders will raise the money required. We hope you will join the hundreds of churches across the UK who have raised the money they need by starting with a search on Church Grants.